The band’s 11th studio album - this is the first new Focus studio album in SIX YEARS! More information: Focus is known around the world for its iconic albums, including the hits HOCUS POCUS, SYLVIA and HOUSE OF THE KING. The band’s 11th studio album showcases the current line-up’s new music and is housed in a stunning 6 panel digipack with new artwork by ROGER DEAN. 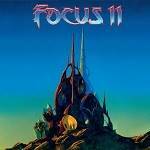 This is the first new Focus studio album in SIX YEARS! The same line-up of the band is touring worldwide in support of the album throughout 2019, building up to a 50th Anniversary Tour in 2020.